Today is the big day! Arielle at Colour Q chose me to be one of her guest designers for this weeks challenge. It has been a privilege over the last few weeks to be joining in on her challenges, not only does she have this challenge blog, but she also has another personal blog and she has won some other challenges in the last few weeks herself. We need to send some love her way also for the new baby girl arriving at her house soon--What a Happy New Year present. 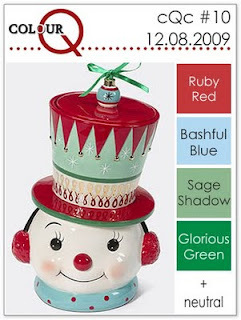 This cute snowman has inspired the colors for this week. 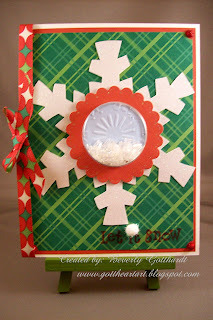 I have to say it was a challenge to get the Bashful Blue in on this one for me, but when I pulled out my Stampin Up treat cups and my large snowflake it seemed like a match made in heaven. I hope the inspiration picture and my card help to inspire some fantastic creations of your own for the Colour Q Challenge #10 this week. Good Luck and I look forward to seeing what you all come up with. Supplies: White Card Blank 5" X 6 1/2" Halcraft, Papers: Creative Imaginations-White Glitter, DCWV The Christmas Stack, Stamps: The Paper Studio-Snowflakes, Ink: CTMH-Z2127 Holiday Red, Snowflake template-A foam ornament kit-Michael's, Cuttlebug Embossing Folder-Snowflakes, Spellbinders Nestabilities-Classic Scallop Circle Lg., Ribbon-Am. Craft Elements, Stampin Up-ticket punch and 1 3/4" circle punch, Mark Richards red glitter domes, small fuzzy pom pom, Stampin Up-treat cup, Wal Mart pkg. of glass beads, Barbara Trombley's Art Glitter-Gala Glitz-White. Congrats! I am so happy for you and this is just the cutest use of the treat cups!